Spray a 15x10x1-inch pan with cooking spray. Pour the cereal into a large bowl. Place the butter and marshmallows in a 2-quart saucepan. Heat over low heat, stirring constantly, until the mixture is smooth. Remove the saucepan from the heat. Stir in the food color until the mixture is evenly colored. Pour the marshmallow mixture over the cereal and stir until it is evenly coated. Pour the mixture into the pan. With the buttered back of a spoon, press the mixture in the pan until it is even. Cool completely, about 1 hour. With 2-inch cookie cutters, cut the mixture into shapes. Decorate the cutouts using the decorator icing to attach the candies. Store the cutouts in a loosely covered container. 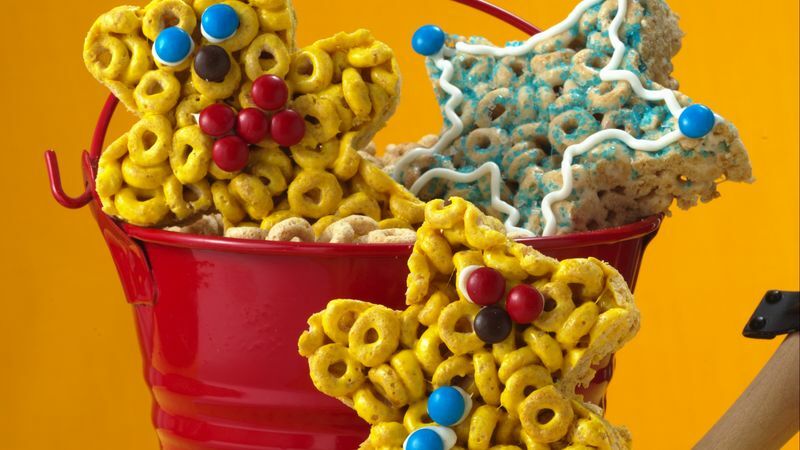 Skip the cookie cutters, and cut the cereal mixture into bars.